GEO-RHEA is a geographic information system (GIS) solutions provider, specializing in 3D analytics and modeling, field data verification, mapping and much more. Based in West Virginia, their services are applicable world-wide but currently focus on the mining and natural gas industries in our general region. BBCG worked closely with GEO-RHEA to create a logo that speaks to the nature of their business while presenting a modern and industrial appeal. And the tagline – What On Earth Are You Doing? – adds a nice bit of whimsy. The name pays homage to the Greek goddess Rhea, who was known as "the mother of the gods." These billboard designs were part of a multi-media campaign for the Prestera Center for Mental Health Services, Inc. and its Addictions Services for the Charleston, W.Va. area. The campaign also included a television spot and print ads. What's unique about this campaign is that we utilized six different images on the posters instead of a single design. 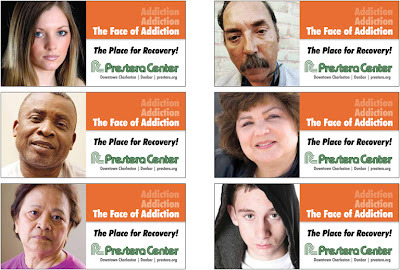 This helped highlight the fact that addiction does not discriminate against race, age, gender or socioeconomic status. 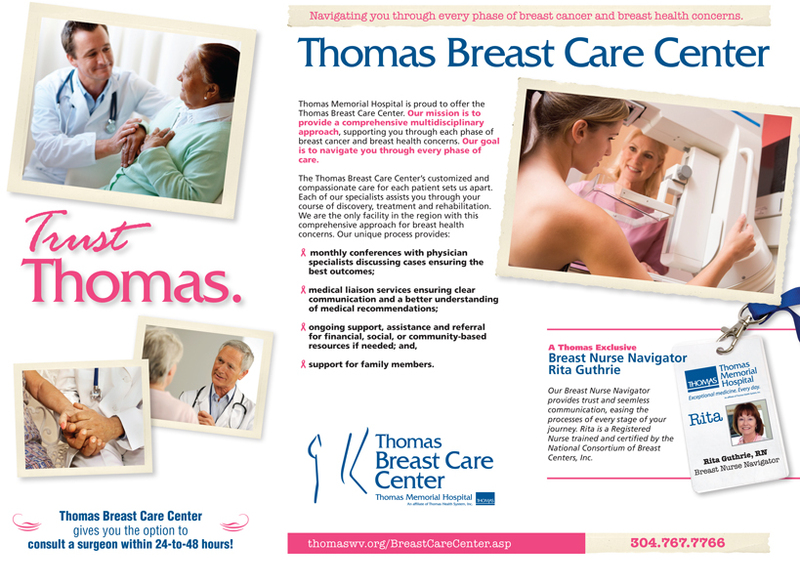 This is the inside spread of a brochure we designed for Thomas Memorial Hospital's Breast Care Center. It highlights the specific traits that set Thomas apart from other hospitals in the area, including the exclusive feature of a Breast Nurse Navigator who provides seamless communication through every phase of care. Another quality of the Thomas Breast Care Center is the option to consult with a surgeon within 24-48 hours of making contact with them. For more information, call 304-767-7766 or visit them online. 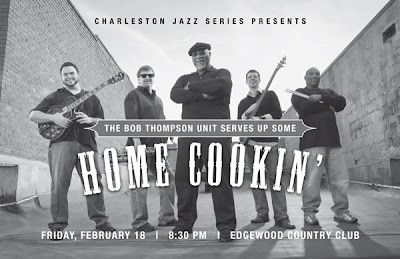 We've posted samples of Charleston Jazz Series brochures in the past, but since this upcoming performance is from local jazz stalwarts The Bob Thompson Unit, we had to share. Having performed around the country and throughout the mid-western region for many years, they primarily play original compositions with classic tunes and standards included in the mix. This particular performance will be Friday, February 18, 2011 at Edgewood Country Club. Visit the Charleston Jazz Series to reserve your tickets! The Faith in Healing campaign for Saint Francis Hospital, which featured this :30 TV spot, also included print advertisements and the billboard design shown above. "Faith in Healing" is a :30 television advertisement for St. Francis Hospital in Charleston, West Virginia. 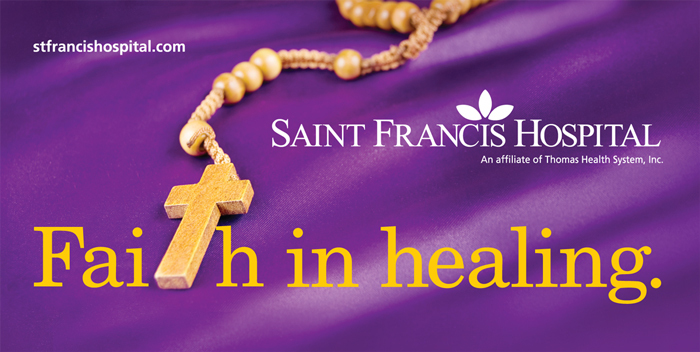 BBCG produced the spot for St. Francis, which is part of Thomas Health System, Inc. Airing locally on all network stations, the spot is part of a multi-media campaign that also includes billboard and newsprint.